AUDIO: Consistency key to Nasarawa Amazons’ league triumph. Nasarawa Amazons assistant coach Seyi Michael Olaoye has told busybuddiesng.com how much winning the Nigeria Women Premier League title means to him. Exactly two weeks ago, Amarachi Okoronkwo scored the only goal as Nasarawa Amazons defeated Delta Queens 1-0 in the final of the NWPL Super Four to clinch the league title for a second time after they won their first title in 2013. In the absence of head coach, Christopher Danjuma, it was Seyi who took charge of the Lafia-based side throughout the season-ending tournament in Benin as they lifted the trophy without losing a game. “For my career as a coach, I would say it is one of the happiest days of my life. Because since my head coach has been in the team, he told me any time they get to the final they lost. When I came in, the same thing – we got to the final last year and we lost. So this is not only for me even for him (Danjuma), this is his first trophy as an Amazons coach so it means a lot to us,” Olaoye explained. Players and officials of Nasarawa Amazons were on Wednesday hosted and rewarded by the Governor of Nasarawa State, Umaru Tanko Al-Makura for emerging 2016/17 Nigeria Women Premier League champions. The governor announced a reward of ten million naira at the Government House in Lafia during a special ceremony in honour of the league winners. Apart from the 10 million naira, their title-winning feat also prompted the governor’s approval of thirty-eight million naira to settle the sign-on fees of all the players and officials of the club, even as he added that their emoluments will be reviewed and subsequently enhanced. This gesture of recognition and appreciation by the Nasarawa State Government will definitely serve as a huge motivation to Nasarawa Amazons as they intend to remain at the top. “Apart from this season now, previous seasons we used to get to the AITEO Cup semi-final. Then in the league we will get to the ‘Super Four’ or ‘Champion or Champions’. When they played ‘Super Six’ we were there. Last year the group stages champions played, we were there, so you can see the consistency. So we are a team to reckon with but I am promising you that we want to be up there, we want to remain there,” he declared. 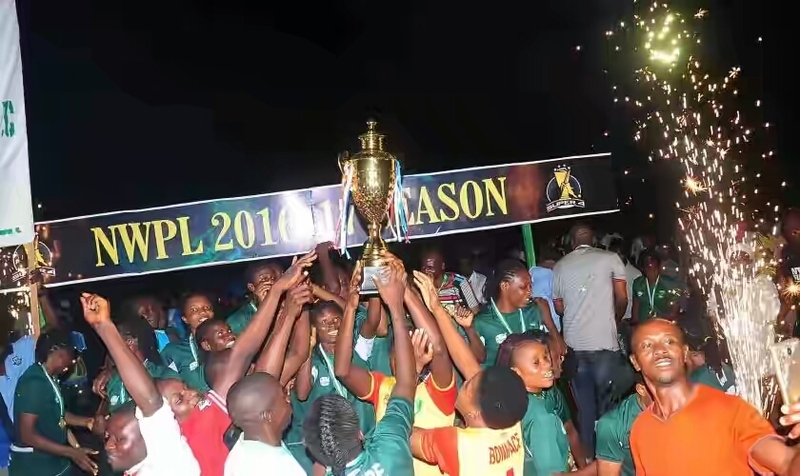 Since winning their first league trophy in the 2012/13 season, Nasarawa Amazons have always made sure of a place in the season-ending tournament except in the 2013/14 season which was a straight league. That same 2012/13 season, they finished runners-up in the Federation Cup, and have made sure of at least a semi-final place in subsequent editions – losing to Sunshine Queens twice (2014, 2015) and Rivers Angels (2016) – except for this year when they were knocked out in the quarter-finals by Bayelsa Queens.